Midway through the 10th edition of the Buenos Aires Festival Internacional de Cine Independiente (BAFICI), an acrid, ashen fog shrouded the city. “Humo!” cried my cab driver indignantly, an affable, septuagenarian driver who’d probably spent the better part of his life tucked into a bucket seat watching the world unfold through a rectangle windshield (the distinction is not lost on even a freshly-heeled film viewer). Smoke it was, emanating from fires which the government was quick to blame on farmers clearing land for cattle grazing. That it came just weeks after a suspended national strike (over rising export costs on soybeans and sunflower) lent the situation a decidedly political, um, air. Pace Susan Sontag’s insight of a phenomena so real it can only be described as movie-like, the smog occasioned cinematic speculation that perhaps only an international coterie of press and industry could appreciate. The most convincing theory floated that Swedish director Roy Andersson, given a slot in the festival’s broad Retros and Focus section, had arrived at the airport. Buenos Aires’ usual riot of colours was leached of vitality, a mise en scène only the miserably optimistic Swede could have fashioned. Likewise, sightings of Lee Kang-sheng – muse to Tsai Ming-liang and here with his own directorial effort Bangbang wo aishen (Help Me Eros) – left an uncanny impression that the smog had drifted in like some leftover metaphor of Malaysian malaise. “You came for the films?” a colleague derided me facetiously, bringing home the point, while a reknown local critic assumed the DJ mantle for another late night/early morning revelry in the name of film culture. Pre-noon press screenings, in particular a four-hour Argentine entry called – as a rejoinder to Carlos Sorin’s Historias minimas (2002)? – Mariano Llinás’ Historias extraordinarias, were anticipated like a dreaded wake-up call. Snooze, however, and regret it come award time: Llinás’ film was the arguable standout of the Argentine competition. BAFICI’s program runs vast and deep, and the possibilities were boggling. Was the image of a boat coursing downriver amid the reeds of the Parana delta ubiquitous? 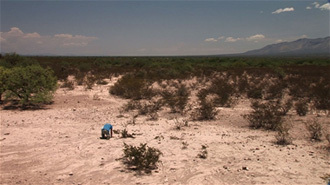 Defining in a narrative and tonal sense – perhaps Lisandro Alonso’s Los Muertos (2004) had some influence on Paulo Pecora’s moody El sueno del perro (A Dog’s Dream), or maybe it’s sheerly a factor of geography – the image sums up how one travels BAFICI: one doesn’t navigate a course so much as surrender to its pull. Resistant to any comprehensive overview, the festival demands committed attendance for the full duration if it is to be spoken of intelligibly at all. In short: dilettante viewers would suffer! And so it was that I passed on retros of Romuald Karmakar and Wakamatsu Koji, among others, in an attempt to stay climatised to certain trajectorias in the international scene, while keeping an eye peeled for any breaking waves from the Argentine tide. The belated discovery of Cannes ’07, Lee Isaac Chung’s Munyurangabo is astonishing for its improbability as well as its realisation. A young American director born to Korean immigrants, Chung went to Rwanda in the wake of genocide and crafted a shoe-string tale of two boys who set out, at first buddy-like but then increasingly divided by lineage, to avenge the murder of the eponymous boy’s father during the genocidal campaign. The revenge narrative, however, remains latent beyond a context of family drama and, most immediately, an intimacy between the two boys as they travel by foot across the arid terrain, lugging backpacks, talking. 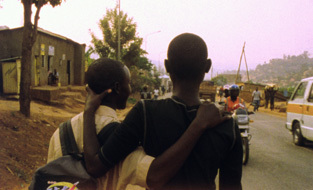 The film’s indelible, recurring image features the boys walking, shot from behind and held within the frame for unhurried stretches. The weight of history hangs over the film but it never bows from the pressure, just as the boys are inextricably bound to strict destinies but still must stop along the way for a simple change of clothes. If Chung’s perspective is indiscernibly non-native, questions of agency and authenticity become unwitting factors in the film’s scope. So natural is Munyurangabo’s portrayal that it appears to have been directed by an insider. Is the distinction an affirmation of empathy or a failure to recognise difference? I pose the question rhetorically as it seems to reflect the inscrutable impasse that any discourse on race entails. “I am interested in contrasts” tells me Michelange Quay, whose Mange, ceci est mon corps (Eat, for This Is My Body) takes an overt approach to race, class and colonialism through means more performative than narrative. If the stark dialectic of, say, perfectly white cream on black skin appears obviously symbolic of Haiti’s colonial legacy, the staging of such overt contrasts affects a mannerism that re-codes rather than reifies racial tropes. Lance Hammer’s Ballast is both ode to and lament for a Mississippi Delta community. Inostensibly a film about race, Ballast nonetheless incurs the unfortunate tag of a “black film by a white guy” (yes, I overheard this at the film’s Sundance premiere, and wondered what kind of traction an American Southset film had with the South American set). Hammer has stated that the film is about nothing more than site-specific, quotidian experiences that might be potentially universal, and yet to set it within the American south and not feature African Americans would be simply irresponsible. I would be interested to hear any account of Ballast as unconvincing (aside from what has come to be the Dardennes comparison). Hammer works with his non-professional cast in a radically restrained way, and pares back narrative through very economical exposition, to achieve a palpable and ambient portrait that’s astonishing for a first film. Heartbreaking. Incidentally mining territory familiar to the films mentioned above, but belonging in a realm unto itself, was Nicolas Klotz’s La blessure (2005) – the highlight of a retrospective that included his trilogy begun with Paria (2000) and punctuated with La question humaine (Heartbeat Detector, 2007), along with two shorts co-directed with his collaborator Elizabeth Perceval. The film came recommended to me as nothing less than a “high masterpiece”, and as a way of contextualising the film it bore certain similarities to Claire Denis’ hard looks at migration and identity (albeit less aestheticised) and Pedro Costa’s communal lyricism (albeit less hermetic). A nominally simple story about an attempted reunion between a husband, now residing in Paris, and his wife, arriving from Africa, the film charts their initial separation by brutal French immigration policies and the subsequent emotional alienation that such treatments engender. The wound in question is the result of a train door crushing Blandine’s leg as authorities try to deport her; cumulatively the wound comes to express an incalculable amount of suffering on behalf of unwanted immigrants anywhere. The film is suffused with sorrow, pain and unforgettable tableaux in which Klotz seems intent on recovering his subjects’ dignity. What at first I took to be a miscalculation – Klotz cues a pair of Joy Division songs, seemingly diegetic, to sequences that scarcely call for musical intervention, let alone of a morbid pop variety – became instead instances of uncoiled lyrical power emanating from an otherwise austere source. Ian Curtis was ubiquitous: gazing out from the cover of Les Inrockuptibles at every kiosk, there in Anton Corbijn’s Control, enigmatically remembered in Grant Gee’s documentary Joy Division. But nowhere was the melancholy of the music so poignantly tapped as in Klotz’s film. My soundtrack to Buenos Aires expanded unexpectedly to include frontman Curtis’ cold baritone, oddly comingling with Dino Saluzzi’s sparse jazz tangos, expatriot Argentine composer Mauricio Kagel (see also süden, below) and, in the surest indication that it was time to decamp from an all night tango parlour, a band launching into an instrumental version of “Hotel California”. La France director Serge Bozon, itinerant DJ, tried his moves out on an unsuspecting festival crowd, but a less than perfect sound system couldn’t do justice to the type of sunshine pop that enervates his otherwise sullen war film. Martin Rejtman, the influential good uncle to the Argentine new wave, was also enlisted, along with actress/musician Rosario Blefari, as a resident DJ. My impression of the festival as an affable and inclusive affair was confirmed, even without some young guy named Lisandro, director of a secretly screened film called Liverpool, offering rides to the next venue. The Mexicans, of course, made a good showing. Carlos Reygadas’ elemental Stellet licht (Silent Light) continued its ascendance up the festival circuit. Reygadas assistant Pedro Aguilera’s debut La influencia (The Influence) is a minimal family drama from Spain that can be seen, in retrospect, as a modern urban fairy tale on the theme of “when mother’s away”. Aguilera, like Reygadas, employs a detached style that invites ironic readings of narrative content that only serve to disarm the viewer in moments of crisis. Tragedy, in both films, thereby doubles as the viewer is respectfully left to consider not only a void but also the uses of consolation. The curiously titled documentary Intimidades de Shakespeare y Victor Hugo (Intimacies of Shakespeare and Victor Hugo) by first time director Yulene Olaizola is deceptively rich, as the director taps the memory of her grandmother, Rosa Elena Carvajal, ensconced in her residence in Mexico City at the intersection of the title’s auspiciously named streetcorner. Carvajal is a formidable subject herself, presiding over her granddaughter’s technically modest inquiry with an engaging amount of self-possession. But the film’s real subject, only gradually revealed, is the lodger who spent years in her midst, a mysterious Jorge Rios, gay serial killer who preyed on female prostitutes on nearby Paseo de la Reforma. Though he attempted to torch his legacy by setting fire to the rooftop shack in which he dwelled, above Carvajal and thereby closer to heaven, Rio’s spectral presence haunts the house today and is paradoxically recalled with fondness by his initially unsuspecting hostess. Already a huge success at Mexico City’s FICCO (Festival Internacional de Cine Contemporáneo), Intimidades de Shakespeare y Victor Hugo won top honours for best film International Selection at BAFICI. I’m uncertain as to what, if anything, the Wadley of Matias Meyer’s said-titled debut refers to, but his sketch of a plot put me off for involving a peyote trip alone. Film, inherently surreal, rarely seems to communicate hallucinated states without resorting to some bad wizardry. But French born Meyer, clearly under the influence of Van Sant’s Gerry (2002), among other things, adheres to his desert drifter wandering toward nowhere with exceptional clarity (save for one unnecessary freak-out). There’s a moment-to-moment sense of reality – as defined by the twin forces of subjectivity and environment – simply unfolding. At once minute and expansive, Wadley is a true sleeper. I owe the half-page film still in El Amante Cine, in which the lone protagonist stands on a river bank flecked by shrub and an obscured horse, for providing the slightest impetus to check it out. The Official Argentine Selection was rumoured to be uneven, without a break-out film that might represent Argentina on the international scene while known auteurs such as Lucrecia Martel and Lisandro Alonso polished up new prints for Cannes (just as native futbol greats Lionel Messi and Carlos Tevez now make their livings in Europe). With the BAFICI publication of Cine Argentino 99/08, which chronicles the difficult but ultimately renaissance period of Argentine independent filmmaking, the current crop was faced with a challenging precedent. The closest to realising this legacy, as honoured by the Association of Argentine Film Journalists, was Llinás’ Historias extraordinarias, a tryptich of cross-hatched stories of novelistic range and featuring lots of duplicity, multiple identity, some vague arcana, and a bag of loot. Indebted somewhat to Adolfo Bioy Casares’ genre-splitting style (for example his novel La invención de Morel, 1940), the film threatens to buckle under bulky narration (redeemed by dryly ironic delivery), a twangy, obtrusive soundtrack (ultimately no matter), and becomes cumulatively more than less compelling in its affection for detail. Llinás made up for the film’s long running time by making the tersest of acceptance speeches, raising his trophy compulsorily while uttering “gracias”. Did he know he had the cat in the bag, or was he simply being modest? The return to Argentina of long expatriated, iconoclastic composer Mauricio Kagel – he’s lived in Germany since 1957 – would not appear to be quite a cinematic mine, but Gastòn Solnicki takes to his task admirably in his film süden, documenting Kagel’s rehearsals with a group of younger, devoted followers on the occasion of a festival in his honour at the city’s Teatro Colon. Questions of process, authorship, influence and politics invariably emerge, but Solnicki remains steadfast to the act of music-making, and Kagel is certainly no ordinary music-maker (witness his piece involving 111 bicycles on the city streets). If Kagel’s musical experiments remain inaccessible to some, he’s nonetheless an engaging personality and committed teacher. Kudos to Solnicki who, at half his subject’s age, has made an enlightened choice that speaks across generations. Among other Argentine selections, Una semana solos (A Week Alone), Celina Murga’s much-anticipated follow up to Ana y los otros (Ana and the Others, 2003), promoted to the international competition, had little to recommend it, in spite of a special jury mention. The children of a bourgeois family, left alone in a suburban house without parents, are confined by their own sense of privilege. Enter the less-privileged teenage son of their doting maid and… an after-school special is born. Entirely more obscure but of some consequence, Gustavo Fontán’s attempt to give fleeting form to the poetry of Juan L. Ortiz in La orilla que se abima (The River Bank that Becomes Abysmal) succeeds as an abstract nature documentary in which the only words uttered are those of Ortiz. How to measure images that aspire to the Argentine poet’s musings on the pallidness of unremembering but to succumb to the film’s evanescent texture, which looked gorgeous on a consolidated video copy but was too scattered on the large screen. Alejo Hoijman’s Unidad 25 (Unit 25), a documentary about an evangelical penitentiary (i.e. the only prison/church of its kind in Latin America) and a doubting new inmate, certainly looks the part. A burnished aesthetic disguises the film’s methodology, unnoticed by me until a certain Variety reviewer leaned in to ask if I thought the dialogue was real. Was this an inside job? That the jury awarded it for “good development of a classical narrative of the social condition” only lends to speculation of the film’s less-than-objective motives. No such problem for veteran Brazilian documentarian Eduardo Coutinho, whose Jogo de cena (Scene Game) deliberately blurs fiction and documentary techniques as a means of exposing underlying assumptions of how truth is generated. As for instance the way a staged portrait often reveals more than an expressive, supposedly candid one, Coutinho solicited 23 women to face his camera and tell him stories of their lives, then presented the material to 23 actresses to interpret them. The end result mixes the real and the reconstructed, as if to enact Godard’s theory that fiction and documentary involuntarily exchange their intended goals. It’s a nimble move for an august director, though I suspect most of the reflexive nuances were lost on me in translation (the absence of English subtitles had me guessing about a film already rooted in the deception of appearances). Surely such descriptions scarcely begin to prod the depths of BAFICI, and neglect to situate the festival in relation to editions past or in an international context. Yet a litany of titles held up for critical inspection might anticipate, albeit far less scrupulously, Borge’s parable of a cartographer who drew a likeness of an empire so exacting it superseded the original. In other words, for a festival with over 1000 shows, a synopsis is inevitably doomed but preferable to a thesis. Festival attendees emerged from the common meeting point and generic multiplex in the Abasto neighbourhood only to be engulfed in the greater drama of Buenos Aires nights, with cab drivers eager to show off Diego Maradona’s favourite house of ill repute, cartoneros with their mountains of recycled garbage teetering on makeshift dollies, spectral silhouettes of Orthodox Jews dashing through currents of traffic, surgically modified women queuing anxiously outside designer discos named after obscure philosophers… As nights wore on, critical talk of film became brief and forgivably less forgiving, more snap in its judgements. The new Parisian-set film from Hong Sang-soo, Ban gua nat (Night and Day) was considered too long, by most reports, though I could easily suffer Hong at twice the length, goofy camera zooms included. That a throng of spectators, young and old, crowded a large theatre on a Thursday night for a Korean film says something about either Hong’s popularity among Porteños or a developed cinephilic sensibility in general. When the pressures of discovery (is there such a thing anymore in an all-connected film culture?) proved too daunting, there was the consolation of known pleasures. José Luis Guerín’s En la ciudad de Sylvia (In the City of Sylvia) was presented with its companion piece Unas fotos en la ciudad de Sylvia (Photos in the City of Sylvia). The two pieces deserve to be seen together: critics of the former (I’m trying to distil various viewpoints shared over the films) have suggested that the presence of an empirically known woman too easily satisfies Guerín’s otherwise fantasmic – formal and romantic – pursuit, and in the case of the male “dreamer” the use of an actor as a means of consolidating ways of looking is both distracting and narrowing. Both critiques would then seem to favour Unas fotos en la ciudad de Sylvia, with its unlocatable narrator and host of pursuits, for offering more of a conceptual absence where a man and a woman once were. This framework puts the photographic film in the company of French artist Sophie Calle, particularly her Suite Vénitienne (1980) and Les Hôtels (1983). But easy to overlook in Guerín’s En la ciudad de Sylvia, with its dizzying use of sound and spectacle of gorgeous faces, is the often available possibility of viewing the film non – or certainly less – subjectively. The film indulges the act of gazing as a means of freeing, rather than imposing, specific views. And so Guerín’s film(s) reward repeat viewings. Also from Spain, Rafa Cortés’ Yo (Me) is a tightly framed doppelgänger tale of a German worker who arrives in an unusually inhospitable Majorca only to find that he’s been preceded by another Hans. Cortés teases out the existential implications ever so slightly, and the suspicion that Patricia Highsmith is up the director’s sleeve retrospectively lends the dark tale a huge dose of levity. And finally, has the internet romance found its most elegant expression on film to date by the unlikely auteur of Bar-roque chamber dramas and medieval date movies? In “Correspondences” (part of Memories, the 2007 Jeonju Digital Project), Eugène Green continues his inimitably styled exploration of love, language, and the object world through which desire might pass en route to an other. “When we sense we’re becoming a link between two pieces of the world it makes something visible resonate like a word” writes a young man to a woman he’s glimpsed at a rocker’s ball. Funny, romantic, philosophic, spiritual: Green gracefully manages to alight on all of it in 39 minutes. Who else could turn a red knit cap into a transformative object worthy of Rilke? By closing weekend the smoke had lifted and the city stretched out in what writer Alicia Dujovne Ortiz identified as horizontal vertigo. Feral cats sunned in the botanical garden. Dog walkers fanned their canine bouquets over sidewalks split by jacaranda trees. I took a taxi to the airport, not before a stop at Malba (Museo de Arte Latinoamericano de Buenos Aires) to pick up the “Alonso Box” – a collection of DVDs by the Argentine director Lisandro Alonso, whose rarely screened La libertad (2001) warranted the 180 peso price. Upon return to North America, with my loot of Boca Juniors shirts and yerba mate, I realised the Alonso Box was not entirely intact. Instead of La libertad, someone had swapped another copy of Los Muertos. An accident? In movie crazy Buenos Aires, probably not. But I’ll be back next year to see if I can have my Freedom back.